If Day 3 at SXSWedu was a day of disappointment the Day 4 was one of affirmation. Affirmation of the fact that there are people that care, are looking at how we can change and actively working on those transformations. The morning panel was titled Breaking the University From the Inside Out hosted by Allison Dulin Salisbury (EdSurge – Dir, Higher Education Strategy) and included Josh Kim (Dartmouth College – Dir of Digital Learning Initiatives), Sean Hobson (Arizona State University – Chief Design Officer EdPlus) and Paul Freedman (Entangled Ventures – CEO). The discussion centred around how innovation was structured and supported in the two institutions while Paul provided an industry perspective on working with institutions. Josh and Sean offered quite different models for how innovation works in their institutions. Josh outlined how at Dartmouth it was often an outside in approach that worked. Innovation occurred at the edges and made it’s way into the core learning and teaching via the main learning and teaching support unit. Sean offered a radically different approach, where at ASU innovation has become a central part of the organisation. The EdPlus part of the organisation was in charge of developing new models and technology for digital teaching and learning. This central unit was also responsible for strategic partnerships and they’d developed relationships with 150 companies and ventures. Paul’s insight was that the only companies that are successful in EdTech do it with an institution – outside in is a design flaw & doesn’t work. One of the key hurdles noted here was that often University incentive structures work against innovation, which re-enforces a risk adverse environment. A model suggested to mitigate this was to start innovation outside the core, where the risk of failure isn’t there, but to ensure there is a transition path so that successes are bought back into the core. The discussion around the links between the educational institutions and EdTech companies was interesting to note. Both sides seem to agree that the relationships with vendors are too often transactional. They’re not partnerships, or even collegial and maybe because there is little transparency and divergent interests. The reality is that Edtech can’t answer the questions universities are asking – is effective, does it improve learning, does it improve retention – and they won’t be able to until they start to show respect for instructional design and research. EdTech dishing out the “education is broken” narrative at every opportunity is reducing the possibility of collaboration because it shows little respect for the profession, for history and for the practitioners who are working damn hard. Partnerships are a better way of working but they need to be nurtured and based upon respect. Education is a system. An app is not going to disrupt a system – it’s too big and too complex. While it’s true, I’m not entirely sure how I feel about what it implies. Particularly when you see the influence of the Khans and Gates on the policy and direction of that system. One app might not change the system, but the billion dollars made from one app just might. After the panel I had lunch with Allison, Josh and Anne Keehn and discussed some of the issues that came out of the session. One themes was around collaboration – how do we get more meaningful collaboration happening at institutions? What are the mechanisms, tools and models for doing this? I liked Josh’s insistence that Centers for Teaching and Learning are an incredibly relevant and important part of this conversation. Just about every university has one, but the degree in which they collaborate, pool their knowledge and influence is pretty minimal. What if we empowered these unit and gave them greater visibility? What if they became a louder voice in the conversation? Josh outlines this argument in one of his recent blog posts EdTech Units, CTLs and the Postsecondary Subordination Narrative. I think this is a viable model and a way to quickly gain traction on a global scale. I know a lot of EdTech professionals, but more on an individual basis and what they do personally, not what their university is working on. There’s also little acknowledgement of the EdTech professionals out there – the actual people who work under a thousand different titles, perform similar jobs and have similar problems. EdTech is not a profession just yet, it’s something still undefined and under appreciated. Quite often they are the glue that makes everything work – from technology and systems to professional develop and training through to learning design and pedagogy. I’ve had a few conversations recently discussing this problem – how to we empower people in these roles? What do we need to learn? How can we gain recognition and become part of the broader conversation about education and technology? How can we access the kinds of resources and information we need to work better? SXSWedu didn’t provide any answers, but it did connect me to more people – and that’s a powerful thing. The solutions will never come from technology, it will come from people. An app won’t change the system, but people can. So I’m flying home to Australia after a challenging week here in the US. Challenging is good, but damn, it’s hard work! I got some time to myself, to be with my thoughts and be away from the situation at home, which was a bit of a relief. I was also away from those dearest too me for too long and there was a definite sense of isolation there. I’m beginning to really understand how close knit we are as a family, and any extended time away from each other is hard for everyone. Can’t wait to see them soon!But the conference … How do you describe #dLRN15? It’s complex. This was not your usual conference. While some of the structure was familiar, some was new. The conversation was different. The themes were different. The people were familiar but new. The discussion was broad and inclusive. There was respect and balance and care evident by everyone who spoke. and first time in Palo Alto, Silicon Valley and an elite institution like Stanford. That’s a pretty heady mix and a brew shared by many of the attendees and why I think it’ll require sometime before we’re able to really process the conference and what we might do next. So to be honest I don’t think I’m ready to unpack the themes yet, but I do want to make an observation. This is the first conference I’ve ever been to that dealt with education in the complex and chaotic domains. If you’re new to Cynefin if suggest you check this video best describe I’ve found. Complicated – Society or Professional Conference. While taking it up a notch these conferences focus on analysis of the relationship between cause and effect. Content focussed on investigation and the application of expert knowledge. Through this we get a sense of what good practice is. This conference really did focus on discussing the relationship between cause and effect in retrospect. There was a lot of presentations that referenced the past – success and failures – and attempted to place what was happening in a historic context. We discussed a lot of what had happened but there were not a lot of predictions of what will happen. There was an acceptance that the environment is a complex mix of social, political, cross cultural and economic issues that are locked in step. There was acceptance of complexity for the first time ever – in particular that there is no single solution. As such the presentations and discussion for the most part was very much focussed on the emergent practices of digital learning. It also attempted to place them in a much broader and connected context. grounded in the history of information, was very much a novel approach and alternative to the current model. It’s important to point to the final state of Cynefin – disorder. Which is very much the state of higher education and edtech. That to me sounds very much to the system (and the battle) that everyone at dLRN is involved in. There was something so refreshing about this conference and its ability to move into that complex and chaotic space. Maybe it was the location, the weather or the people, but it felt like something significant happened on the Stanford campus. Maybe it’s the Californian Ideology at play – but judging from the blog posts so far (from @acroom & @googleguacamole) whatever it is it’s left a mark on many of us who were there. This presentation was developed for a series of Think Pieces at Charles Sturt University. I’ve nominated to do these for the last few years, mainly because it gives me an opportunity to explore issues relating to education and technology in a slightly more expansive (and sometimes provocative) way. My take on these think pieces is not for me to do all the thinking – but open up a channel to explore some different ideas. I developed the topic for this presentation about 6 months ago – having a notion of what I wanted to discuss. What I’ve ended up with is probably not what I orginally intended but actually more cohesive. It brings together a number of ideas I’ve previously blogged about (interaction, abstraction & mediation) and ties in with some interesting pieces I’ve been reading recently – most notably this post from Nathan Jurgenson. Nathan’s post appeared at the perfect time – one where I had the ideas but not the taxonomy laid out – so I’ve borrowed quite a bit of his post. Straddling a background in design and an evolving career working in Education I’ve been aware of the the commonalties between the fields of user experience (UX) design and learning/instructional/educational design and the opportunity for cross fertilisation. So I’m really interested to see the emergence of an attempt to formalise the relationship between two. This post are some of my initial thoughts. At this early stage I think it’s vitally important that Learning Experience (LX) doesn’t fall for some of the misconceptions that mystify and befuddle UX. I fundamentally disagree with the way the image is labelled. What we have here are two alternate USER INTERFACES. The User Interface is the tool or process in which to achieve the intended goal, it’s central component but it is only part of the user experience. The experience relates to the journey to the destination. 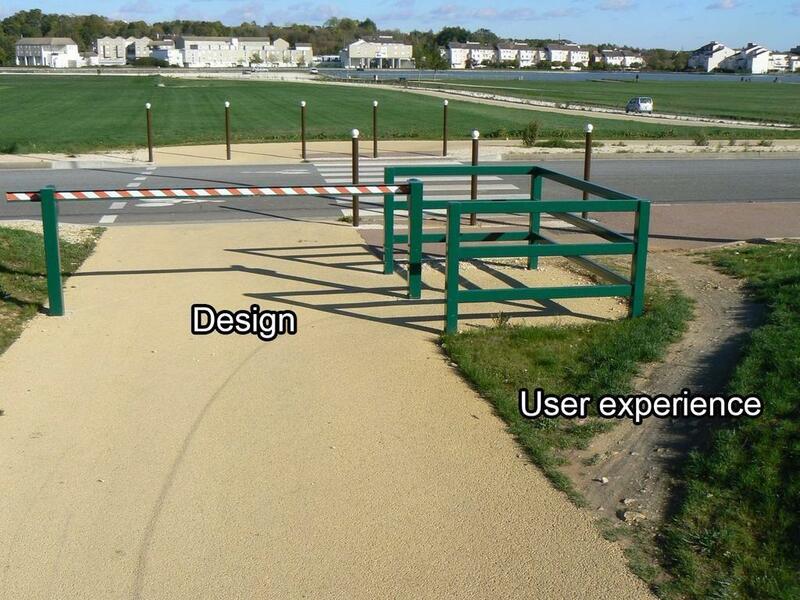 Of course the interface, or the way that we get there impacts on us but it’s not the user experience. It’s part of a greater whole. Those interested in learning design can quite quickly see the commonalities between this model and say TPACK and how things tend to overlap and overlay rather than act in isolation. You can also see why the User Interface is so often confused with UX – it’s the central component that overlays each of the other disciplines, but the centre is not the whole. User Interface is a street light. User Experience is an evening stroll. User Interface is a surfboard. User Experience is riding the tube. User Interface is a camera. User Experience is a memory. User Interface is a door knob. User Experience is keeping your conversation private. User Interface is a book. User Experience is a land far, far away. User Interface is a dimmer switch. User Experience is a romantic evening at home. Understanding UX and designing for it is almost the antithesis of business as usual because as human beings we don’t take the time or make the effort to see how things connect. In that sense its very much the same way we see Learning. We tend to think of learning as this linear storyline but that’s only how we picture it in hindsight. LX could provide a way for education to move beyond thinking in this linear way because it’s not how UX works and it’s not how learning works either. We have to start embracing the complexities of learning and design with that in mind, rather than seeking the simplicity of a single model, technology or mode. I think LX is a concept that not only has legs, but it’s one that is vitally important as we attempt to make use of the affordances of our rich, connected and digital world. User Experience is a big concept made up of tiny details, connections and relationships. Learning Experience needs to ensure that it thinks of itself in the same way.